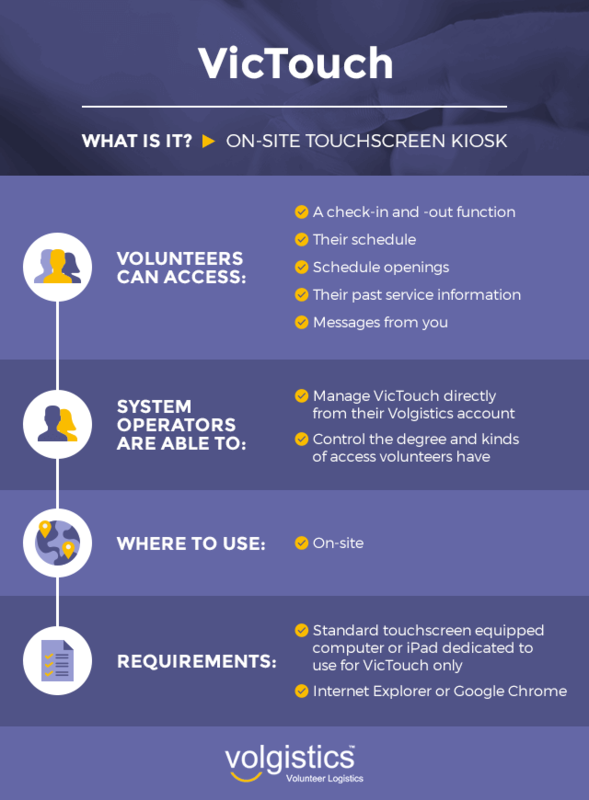 VicTouch is the optional software module you can use with Volgistics to provide on-site touchscreen workstations or kiosks for volunteer interaction. Check in when they arrive and out when they depart from your facility, with their volunteer service going right into your Volgistics database. Check their schedule, sign-up for schedule openings, and alert you to times they cannot serve as scheduled. View their past service information. Receive messages and greeting cards you send them. VicTouch works seamlessly with your Volgistics account, and you control the degree and kinds of access volunteers can have. You manage VicTouch from the Setup area inside your Volgistics account. VicTouch is ideal for organizations where volunteers serve primarily at one facility or campus, such as hospitals, museums, zoos, aquariums, schools, and more. VicTouch works with standard touchscreen equipped computers or Apple iPad to provide a touchscreen interface that makes volunteer interaction as simple as touching the screen. Organizations that choose to use this optional component may install one or more VicTouch systems in their facility. Each VicTouch system requires one dedicated personal computer and touchscreen monitor (all-in-one PCs are also a great option). The requirements below apply only to the computers where you'll run the VicTouch system, not to the computers you use to access Volgistics itself, or VicNet. VicTouch uses the web to exchange information with your Volgistics database. For this reason, each VicTouch computer must have access to the Internet through a persistent connection, such as a local area network, DSL, cable Internet, or another always-on Internet connection. VicTouch computers do not need to be networked with any other computers in your organization. If you use more than one VicTouch computer, they do not need to be networked with one another. VicTouch is currently designed for use with Internet Explorer or Google Chrome only. Additionally, multiple browsers are supported on the Apple iPad when used with the Guided Access feature. This browser limitation only applies to the VicTouch module itself. Volgistics and the VicNet module are designed for use with any popular web browser. The computer you use to run VicTouch should not be used for any other purpose. VicTouch computers are generally positioned so they are easily accessible to arriving and departing volunteers. VicTouch is generally left running on these computers so they're ready for volunteers at any time. Attempting to use the VicTouch computer for other purposes is not practical or recommended.